Ill sock Lou in the Nose This is an incredible ball. The story I have, is it was given to Kathryn (Kay) B Brown, Born Sept. 28, 1896, Married to Herb Ward, No children. She was in Waterloo, or Des Moines She and her husband were rather well off, and had many friends including many ball players. I got the ball from a man named Jack, Kay was his grandmothers sister. Kay Passed away June 27, 1980 and left the ball to Jack. 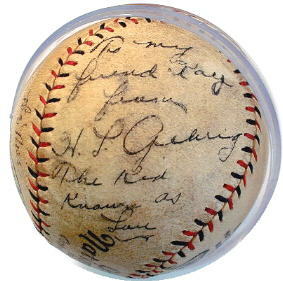 By looking at the inscriptions on this ball, you can just imagine that here is the Babe, and Lou possibly flirting with this attractive young lady at some function. 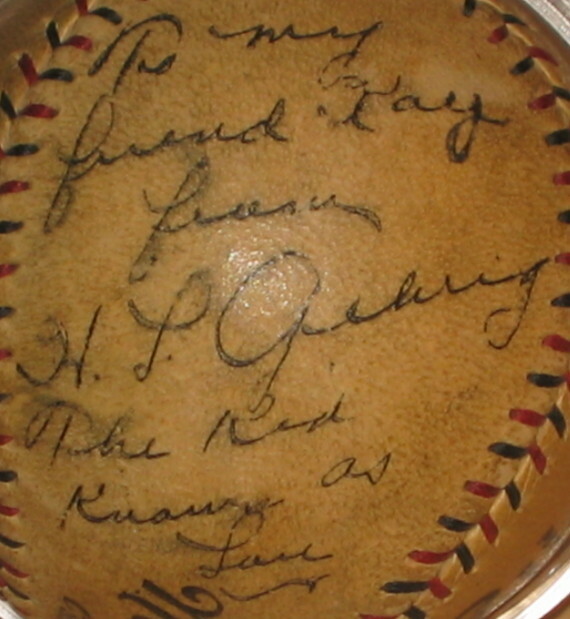 I have spoken to several of the leading authenticators of Gehrig signed baseballs, and none of them have seen a ball signed H.L. Gehrig, and have told me I have a unique item. This is a very unique piece. Update (I thought I put this up a long time ago) Got a call from one of the other grandchildren, or great grandchildren. Apparently, Herb Ward owned a stadium and local team. The story goes that the Bustin Babes & Larripin Lous were playing an exhibition game and the ball was given to Kay as payment for the beer & hot dogs. I was also told that the date of her death was one year later, but I dont think so because I had a program or card with the memorial services and it clearly said 1980. 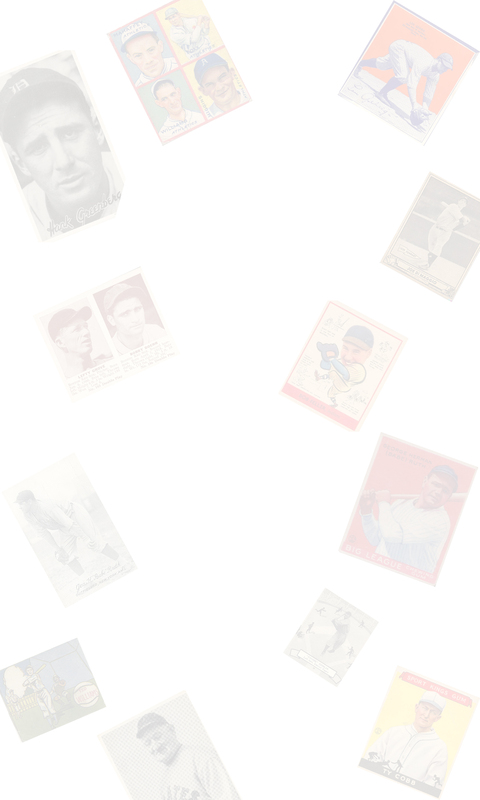 RUTH AND GEHRIG CARDS AVAILABLE FOR SALE! This is the printing that came on the ball. 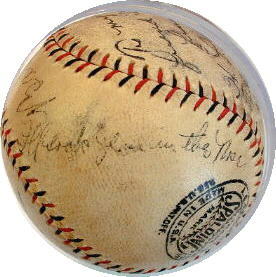 As you can see, this is a National league, western league ball from when Dale D. Gear was the president. His tenure was from 1926 through 1935 which does not really help to date this ball. 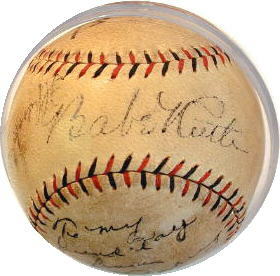 I have now been told by one of the leading autioneers in the sports memorabilia industry that this ball was most likely signed in 1927 while on a barnstorming tour because it is a western league ball. Also, by the way Lou signed it, you would have to guess it was early in his career. will be more than happy to talk to you about the ball.